You must sign into your myHangout account in order to contact cjernst. Here are some pics of my new Huber Truetone I got last week. A really killer sound that just seems to get better every day. Self taught, but recently took a Bluegrass Ensemble course at Old Town School of Folk Music. 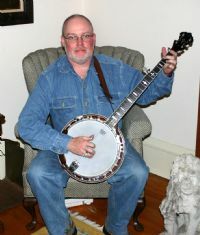 Attended Midwest Banjo Camp in June 2005, Regular attendee of NashCamp. I keep pretty busy, but would love to jam with others to learn more.